The skirt is amazing. You look great! Stunning, so simple and chic! Love your necklaces as well. Great photos and beautiful skirt! I love these pictures and the skirt is so cute! i love how 'poofy' the skirt is! Lovely outfit , the skirt is beautiful! Love your skirt and sandals!!! Love the skirt and heels, and I never would have thought to pair a gold necklace with this type of outfit but I really like it! Awww I love this look, you look lovely dear! You always look effortless. I love the movement to this skirt and both necklaces! OMG! I love your skirt... you´ve done a great job wearing it with that blouse and heals.... you look great! Love your skirt and your necklace, so pretty!!!!!! I have the same ZARA shoes :-) Thank you for the inspiration! You wear the most amazing outfits! Great outfit, so girly and flirty! So lovely! You look great! Love your outfit! May I ask about the nail polish details? It seems to be a perfect shade of yellow! Adorable skirt & love the jewelry! I made a post about those sandals! Cute skirt! love the silhouette! Ultra feminine! Love the puffy skirt (or is it the full skirt)? regardless, you look so cute! I love the skirt on you! It's lovely. BTW, wanted to comment on your Carven heels - they're so cute! I saw a pair of black ones on sale at Barneys during the holidays, and didn't get them, and now they're everywhere! Sigh. Missing a good deal is the worst. Love your yellow ones though! Love the skirt and the simplicity of this look. Gorgeous, so feminine and pretty! You have just convinced me to official purchase those shoes! Love your skirt as well! That skirt is awesome, love the necklaces as well. love the style of this skirt! Adorable skirt and I like how you kept everything else very simple. Very cute look. Wouaww this skirt is perfect !!! love your outfit !! Very cool skirt! Loved your outfit!! This skirt is adorable! Love it. 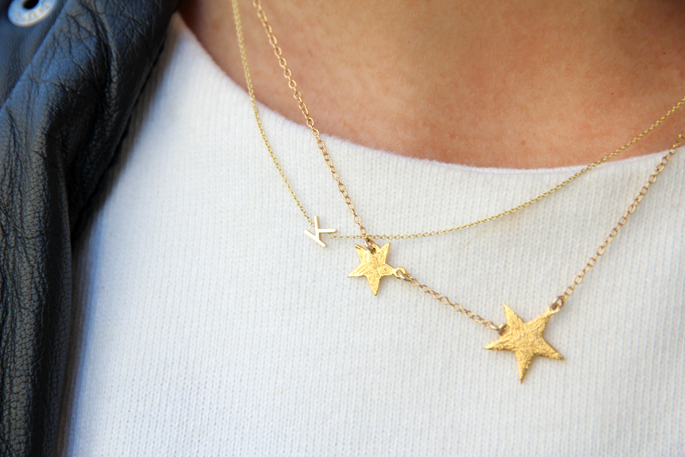 Love the star necklace! I can't wait to get one of my own.